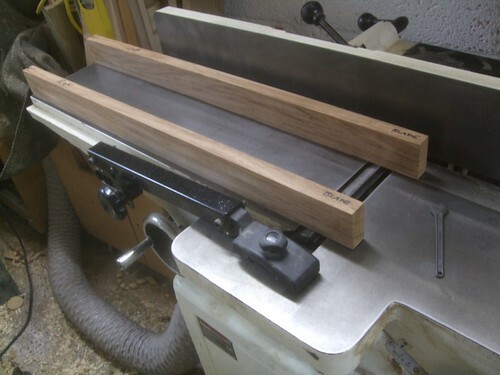 After tidying up my router table this morning and adding the final touches with the featherboard accessories (photos to follow in another post), I spent the afternoon machining up some timber for a small job (yes, timber – not dusty MDF!) 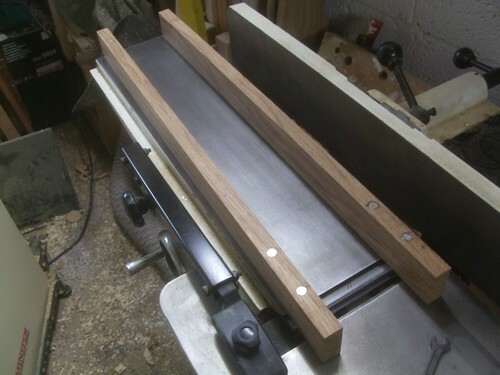 and also set about making a pair of simple-but-effective setting jigs for the knives (blades) on my 6in wide CT150 surface planer (jointer). I started off with two lengths of a chosen hardwood. I went with brown oak, for its stability, in the hope that this lengths won’t distort over time. 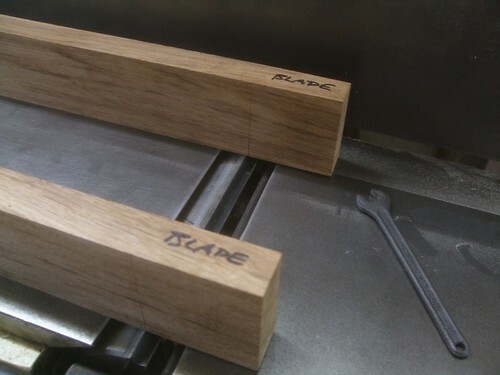 They were prepared from sawn sizes of 2x1in; finishing at 44mm x 19mm. They’re cut 50mm longer than the distance between the end of the outfeed table and the centre-point of the cutter block and they’re held to the outfeed table with rare earth magnets (10mm diameter x 7mm thick). There’s one magnet in from the left-hand end, with another placed close to the cutter block, but in from this end of the outfeed bed. A third magnet is positioned directly over the top-dead-centre of a single knife sitting in the block. I also found it handy to mark each length and designate it to a single side of the bed (left or right), to account for any minor errors that may have occurred while I was drilling the timber and fitting the magnets. 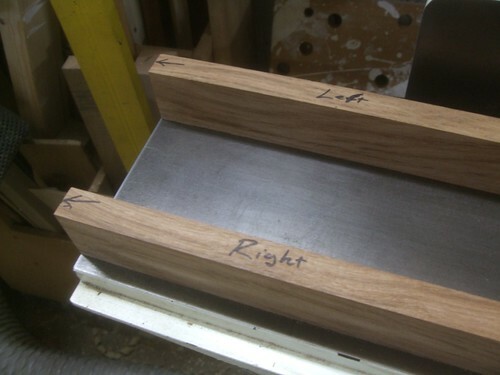 At the other end, I also marked both ‘jigs’, so that I orientate them correctly each time – this is important because this jigs are designed to be fitted flush with the far end of the outfeed table, for correct positioning of the third magnet over each knife. Once the knives are set correctly, I can flip the jigs over and on to their top edges, where the parallel pencil lines I’ve drawn (3mm apart) allow you to check the (by rotating) to see that the knives are set for the correct distance of travel. 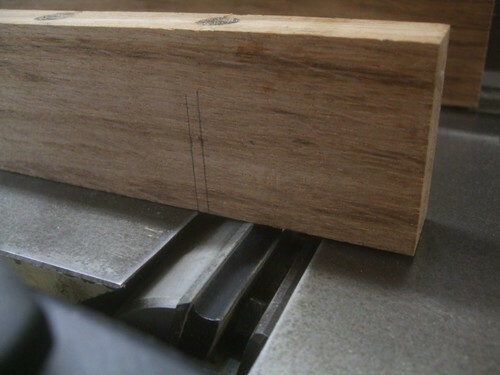 When I set all three of the knives in my machine using this method, I found that they were moving the timber by 6mm (twice the measurement I was hoping for). I could simply raise the outfeed table to compensate for this but, if I was to have to reset my knives often then, I’d soon run out of room to manoeuvre! These magnets are fixed in with super glue and, although I thought I drilled each hole to a precise depth, the action of hammering them in (with a non-magnetic wooden mallet) left each about 0.5mm below the surface of the oak. This could account for why my knives are slightly too high and, with a bit of care, I reckon I should be able to plan the oak down until it’s flush again. If this worst comes to it though, I’ve only sacrificed a small amount of wood! I’ve saved myself £25 and the results are very consistent across the widths of all three knives. There is snipe at the end of a cut but, it’s far less severe that what I experienced trying to set the blades by eye. Olly . 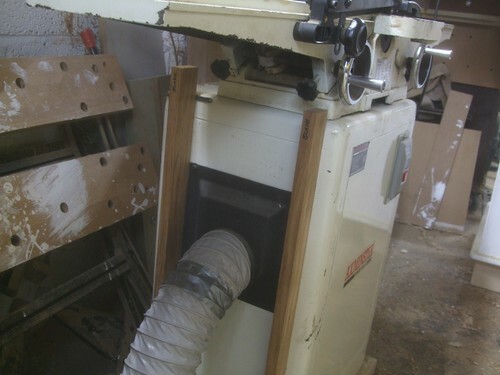 when any planer knifes have just been reset and you rotate the planes by hand there should be no movement of timber forwards when the blade reaches TDC you should just feel the blade touch the timber ONLY without moving the timber jig forwards. When the blade eaches TDC Immediately after the blade begin to rotate in the downwards direction as the next blade begins to rise.